A Falcon 9 rocket blasts off from Kennedy Space Center at 2:49am ET Saturday. 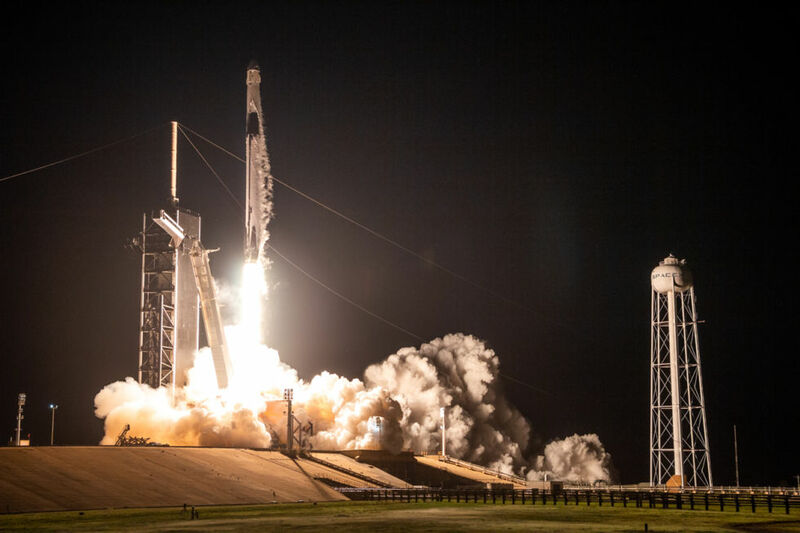 SpaceX's Falcon 9 rocket blasted its brand-new Dragon spacecraft into orbit for the first time early Saturday morning, and so far everything has gone well. After opening its nose cone for navigational purposes, Dragon is now spending about 24 hours performing a series of phasing maneuvers to bring it toward the International Space Station, where it will dock at around 6am ET Sunday. Although SpaceX has been flying a cargo-based version of the Dragon to the station since 2012, the new Dragon has been entirely remade for crew. That includes interior life-support systems, autonomous docking capability, an integrated launch escape system, and solar panels built into the spacecraft itself. "The Crew Dragon is a fundamental redesign, with hardly a part in common with Dragon," SpaceX founder Elon Musk said early Saturday morning, after the launch, during a news briefing. "The system thus far has passed an exhaustive set of reviews, and then the launch itself went as expected. So far, everything is nominal."